miniOrange Single Sign On (SSO) product provides easy and seamless access to all enterprise resources with one set of credentials. We provide Single Sign On to any type of devices or applications whether they are in the cloud or on-premise. 3.1 How to add users? 3.3 How to unlock, locked users? 3.4 How to manage groups? 3.5 How to manage roles? 3.6 How to manage shared identities? 3.7 How to manage apps? 3.8 How to manage policies? 3.9 How to see users and policy mappings? 3.10 How to integrate with any custom application? 3.11 How to deploy pre-integrated applications? 3.12 How to customize SMS gateways? 3.13 How to customize SMTP gateways? 3.14 How to customize OTP Email Template Configuration? 3.15 How to manage License? 3.16 How to change password? 3.17 How to configure Second factor? 3.18 How to edit account profile? 3.19 How to configure forgot phone options? miniOrange Single Sign-On (SSO) removes the need to repeatedly type usernames and passwords, which increases productivity and prevents many types of online fraud that is caused by using same or similar passwords across apps, typing in passwords in un-safe environments, password sharing etc. By enabling users to quickly and securely access applications, they can spend less time with technology and more time with their work. Enterprise users regularly need to remember eight or more application passwords. Security best practices require those passwords be unique, strong and frequently changed. It’s no wonder enterprise users write them down, stick them to the monitor or just forget them. miniOrange Single Sign-On (SSO) addresses these challenges by significantly reducing clicks and eliminating the need to remember or enter application usernames and passwords. Proven in enterprise environments around the world, miniOrange Single Sign-On can be used with all types of applications, saving enterprise users 15 minutes every shift, improving satisfaction levels and driving adoption. Optimized workflows enable faster access to information and enhanced delivery. Passwords become centrally managed, simplifying HIPAA and HITECH compliance without impacting enterprise users or IT staff. Create a free Single Sign-On Trial account with miniOrange. Enter Email Address, Cellphone Number, First Name, Last Name and Company Name. Select Single Sign-On Area of Interest. Account details will be sent to the registered Email address. Download sample CSV format from our console and edit this CSV file according to it and upload it to our console via Bulk Upload. Note: If you can't see the Upload button, please contact us at info@miniorange.com to enable it. 3.2 How to see the Onboarding Status? To see Onboarding Status go to Dashboard tab -> on the right side, under basic features you can see the OnBoarding status just click on that. Here you can see a pie chart, showing the status of user on-boarded. 3.3 How to enable or disable users? To enable, the disabled users go to the Users/Groups tab and click the dropdown menu of the last column then you can see Disable User and Enable User options. Click on Enable to unlock the user and vice versa. To add a new group click on Create Group. Enter a name of your choice and click on Create Group to add the group. You can assign the users to the created group by clicking on the assign users. Check the checkbox of all that users which you want to assign. Hit the apply button to save the users into the group. You can configure admin roles of end users. To configure role of an Enduser click on Add to add the end user as Administrator. Under Apps tab in Admin Console, you can view the Apps and configure new SAML and Browser Plugin Apps. Select a Group Name from the dropdown - the group for which you want to add policy. To deploy any pre integrated applications, please select any of the pre-integrated apps (viz. Google Apps, Salesforce) from the Integration tab dropdown. Follow the integration guide to integrate the apps, the diagram below depicts Google Apps Integration. 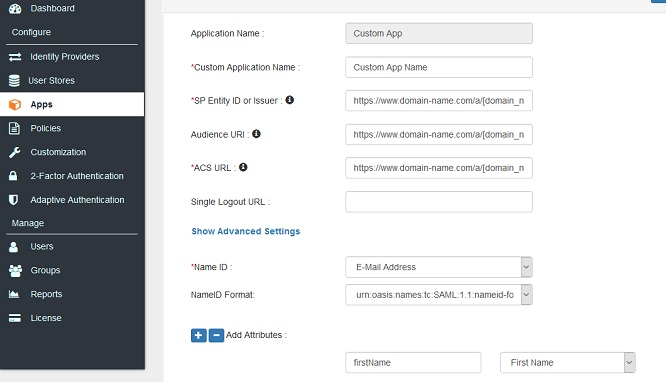 You can add your own customized email to Customization -> Select OTP Over Email Template Configuration. Select Set Customized Email Template, edit the fields as per your requirement. You can test your Email Template Configuration by clicking on Send Test Email. Click on SAVE to save this Email Configuration. You can Change your password anytime you want, go to the Account and select Change Password. On the right side, you can see Strong Auth Methods under Basic Features section. To set forgot phone configuration, go to Account and select Forgot Phone Configuration. Set the forgot phone configuration as per your choice, it is recommended to check alternate login method for security purposes. Our Single Sign-On service will act as a Service Provider to any IDP of your choice. And you don't have to worry about understanding SAML protocol at all. It can work with ADFS, Okta, salesforce, SimpleSamlPhp, Shibboleth, PING, RSA, Centrify, One Login, miniOrange or any other saml identity provider (Idp). This SAML service returns all the attributes provided by the IdP along with the username of the logged in user. You can then use these attributes to login user into your application. To configure and use miniOrange Single Sign-On services, create a business free trial account here. Click here to login to miniOrange admin dashboard. Click on Configure Identity Source Button on top right corner on screen. Add your Identity Source here entering all the required fields and click on SAVE button. If you don't see the specific guide for your IDP, please contact us at info@miniorange.com. To configure and use miniOrange OAuth 2.0 Single Sign-On services, you can create a business free trial account here. Now, go to Integrations -> Custom App Integration and collect your Customer Key, Customer API Key, Customer Token Key from here. Leave the Scope field empty. Create Developers account with Facebook. Collect App ID and App Secret by navigating to My Apps -> (Your App name). Enter the App ID and App Secret in Client ID and Client Secret field respectively under Apps -> Add App Credentials. Click on SAVE button to add the Facebook App. Now to integrate Login With Facebook, add a button and add the following URL to it. ##token## in above URL can be encrypted or unencrypted. The token should contain Client Id (You received from EVE Online), timestamp (Current Timestamp in milliseconds) and API Key (The Customer API Key you collected above) seperated by colon. ##customer_key## is the Customer Key you collected above. Value of encrypted value can be true or false depending on, if the token is encrypted or not. ##returnurl## will be the url where you want to redirect user after Login with Facebook. Enter https://www.googleapis.com/auth/plus.login in the Scope field. At Google, under APIs & auth -> Credentials get Client Id by clicking on the button Create Client Id. Click on SAVE button to add the Google App. Now to integrate Login With Google, add a button and add the following URL to it. ##returnurl## will be the url where you want to redirect user after Login with EVE Online. If you have not already done so, create an application. If you have an existing application, select it to modify its settings. After app creation, collect Client ID and CLient Secret from here. Enter https://auth.miniorange.com/moas/oauth/client/callback in Authorized Redirect URLs and click on Add button. Now click on Update button to save settings. Enter the Client ID and Client Secret in Client ID and Client Secret field respectively under Apps -> Add App Credentials. Click on SAVE button to add the LinkedIn. Now to integrate Login With LinkedIn, add a button and add the following URL to it. ##token## in above URL can be encrypted or unencrypted. The token should contain Client Id (You received from EVE Online), timestamp and API Key (The Customer API Key you collected above) seperated by colon. At EVE Online, go to Support. Request for enabling OAuth for a third-party application. Add a new project/application. Generate Client ID and Client Secret. Enter the Client ID and Client Secret in Client ID and Client Secret field respectively. Click on SAVE button to add the EVE Online. Now to integrate Login With Eveonline, add a button and add the following URL to it. Enter IdP Name and the OpenID Endpoint. Save OpenID configuration by clicking in the SAVE button. Save your LDAP configuration here entering all the required fields and click on SAVE button. 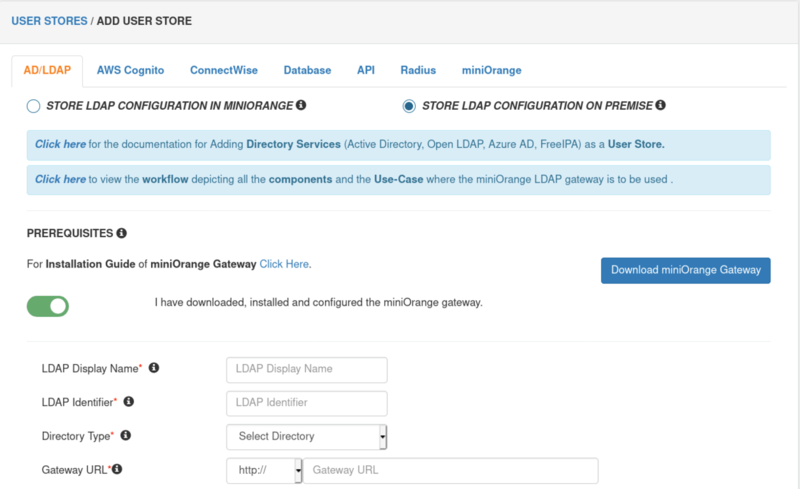 If you want to store your LDAP/AD configuration here in miniOrange, enter your ldap details here and save. 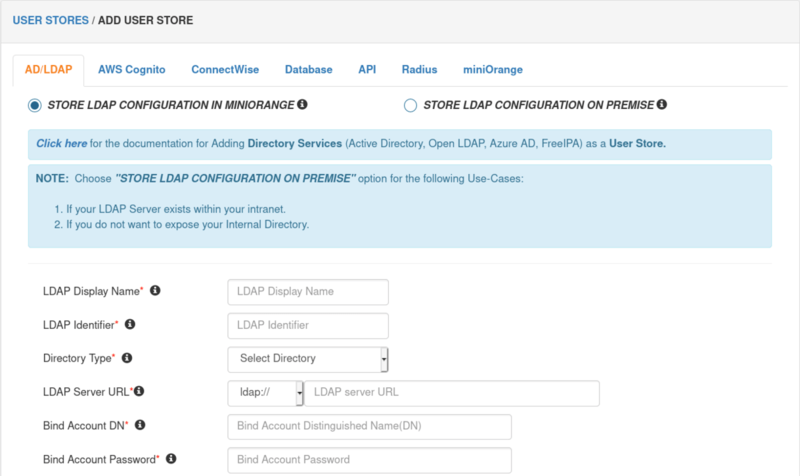 If you want to store your LDAP/AD configuration on-premise, select option two and download miniOrange gateway. To configure apps refer to section 5. Save your AWS Cognito configuration here entering all the required fields and click on SAVE button. Under Apps menu in Admin Console, you can view the Apps and configure new SAML and Browser Plugin Apps. While configuring an app, you need to provide details depending on the type of app. SAML App Configuration: Follow the steps for the apps which support SAML eg. Google Apps, Salesforce. Click on SAML tab. Select your app and click Add App button. SP Entity ID is used to identify your app against the SAML request received from SP. SP Entity is usually but not necessarily in URL format. ACS URL or Assertion Consumer Service URL defines where the SAML Assertion should be sent after authentication. Single Logout URL defines where the user should be redirected after receiving the logout request from SP. You can mention your applications logout page URL here. Audience URI, as the name suggests, specifies the valid audience for SAML Assertion. It is usually same as SP Entity ID. If Audience URI is not specified separately by SP , leave it blank. NameID Format defines the format of subject element content, i.e. NameID. For example, Email Address NameID Format defines that the NameID is in the form of an email address, specifically “addr-spec”. An addr-spec has the form local-part@domain, has no phrase (such as a common name) before it, has no comment (text surrounded in parentheses) after it, and is not surrounded by “<” and “>”. If NameID Format is not externally specified by SP, leave it unspecified. You can Add Attributes to be sent in SAML Assertion to SP. The attributes include user’s profile attributes such as first name, last name, fullname, username,email, custom profile attributes and user groups,etc. Select a Group Name from the dropdown - the group which should have access to the SAML SSO using this app. Give a policy name for Custom App in Policy Name. Select the First Factor Type for authentication like Password, Mobile etc. Click on Save button to add policy for Apps (Single Sign On). Click on Metadata to view miniOrage IDP(Identity Provider) info or to download the metadata file which will be used by SP to configure miniOrange as IDP. Follow the steps for the apps which don't support SAML and any standard protocol eg. Weebly, Squarespace. Click Manage Apps under Apps menu item. Click Configure Apps button. Click on Browser Plugin tab. Select your app(s) and click Add App button. Save application after providing group name. After configuring app you can see the link generated for application. You can embed this URL in your web page saying "Login to Squarespace" or give this URL to your users for login. For testing, SSO goes to user dashboard and download miniOrange Single Sign-On plugin from user dashboard. Configure credentials of application(eg. squarespace) for login using browser plugin. miniOrange provides the facility to host identities in a private directory which can be provisioned as per requirement. Once a directory is provisioned, user management(user provisioning, user-deprovisioning, password management, access levels) is done from the directory. Connection to third-party applications with the directory is provided with various connectors. miniOrange combines the social media data of all your social networks at one place. Whether you are using Facebook, Twitter, Google+, Vkontakte, any social network, miniOrange visualizes and checks your social marketing success, presented in a clean and neat design to always keep the overview. Application connectors also exist for 4500+ cloud and legacy applications. These reports assist in compliance and understanding user behavior. miniOrange provides an array of user authentication solutions to enhance the security of sensitive information and resources. Our Strong Authentication, Fraud Prevention and Single Sign-on products weave together disparate protocols and processes in secure Software as a Service environment providing easy to deploy, scalable and flexible platform at minimal TCO. Traditional two-factor authentication solutions use hardware tokens (or "fobs") that users carry on their keychains. These tokens generate one-time passwords for the second stage of the login process. However, hardware tokens can cost up to $40 each. It takes time and effort to distribute them, track who has which one, and replace them when they break. They're easy to lose, hard to use, and users consistently report high levels of frustration with token-based systems. miniOrange provides 15+ authentication methods. miniOrange Fraud Prevention product uses device, location, time of access and user behavior to minimize the risk of improper data access or loss of information. It dynamically analyzes user requests and apply business security policies to application access which minimizes the risks of unauthorized access. It complements the existing traditional access controls by using contextual elements (e.g. device, location, time of access and user behavior) to allow for a more dynamic policy decision.